When I was young, Lincoln was my hero. I found George Washington less interesting, even two-dimensional. But as I grow older and see more of the dangers that have derailed many hopeful new nations, I am more and more impressed with the judgment and discipline of the American Founding Fathers. I have come to appreciate Washington and the sacrifices he was willing to make to give democratic ideals a chance. As an excellent short Voice 0f America article points out, Washington helped hold the new nation together—a nation it describes as “fragile”— certainly far more fragile than I realized when young. 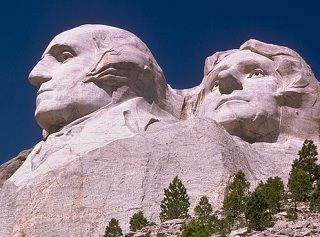 The fact that Washington was not looking for power or money, and that leaders of several contentious factions all trusted him, made all the difference at a time when centrifugal forces and factional power plays could easily have derailed it, as they did many Third World attempts at democracy. A government like the one designed in the Constitution had never been tried. People didn’t even know how it would look, or what its potential was. Washington showed them. As the VOA article says , he really did ‘invent’ the presidency. He gave the office dignity and authority without royal prerogatives and set precedents that are still followed. Voice of America also has an excellent subtitled video on the making of the Constitution, with an audio recording plus transcript on James Madison’s major contributions to it below the video. If you or any of your students are interested in studying for the U.S. Citizenship test, you might be interested in this practice page. Even if not, your students might enjoy or benefit from a crossword with basic American government/civics vocabulary. (Right-click to download.) Its answers are here. There is also a simple matching exercise on famous Americans (pdf)-- or online on the citizenship page.